West Ham's Declan Rice is outperforming England's other holding midfielders, says Hammers manager Manuel Pellegrini. 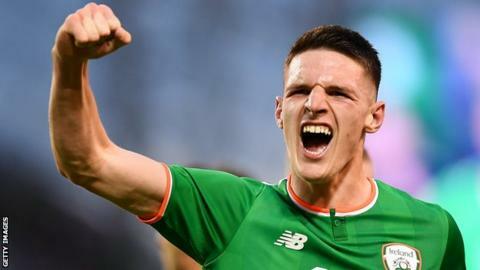 London-born Rice has won three senior caps for the Republic of Ireland - all in friendlies - but last week pledged his international future to England. The 20-year-old has played 59 times for the Hammers, and Pellegrini believes he is ready for an England call-up. "As a young player he will always be learning, but at this moment I think he is a complete player," he said. "At this moment, his performances are better than every English holding midfielder. "Maybe there are other foreign players in big teams that are also playing well, like Fernandinho, but we are just starting to see what will be with Declan in the future." Analysis: Is Rice ready for England? The Chilean claims Rice reminds him of former Hammers, Barcelona and Liverpool midfielder Javier Mascherano, who made his debut at River Plate under Pellegrini. "I started with Mascherano when he was 17 and he was similar to Declan in his mentality," said Pellegrini. "The mentality when they are 17 or 19… it seemed they had the mentality of a 35-year-old. "Declan knows that he is just starting, and that is important."